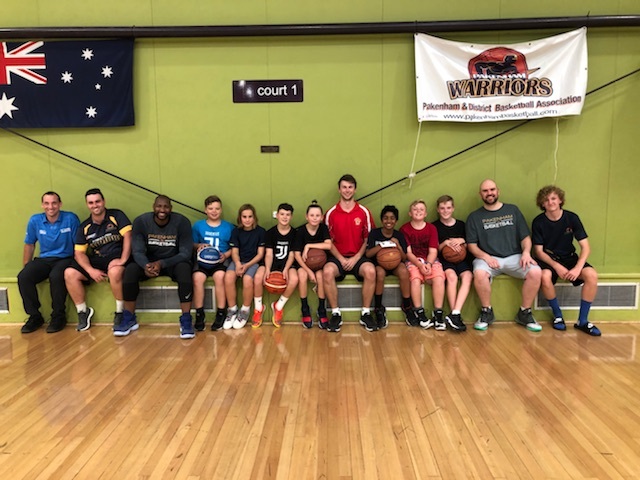 Warriors at Huskies training – Pakenham & District Basketball Association Inc.
Pakenham Huskies Basketball Club had Pakenham Warriors Big V Players & Coach attend some training sessions last week. The players and Coach spoke with Huskies players, ran some drills and socialised with them. Great fun was had by all. Pictured is “The Bolting Huskies” U12 team coached by Big V Development Player Logan Mills with Warriors players Ben Gaze, Josh Bjelan & Brad Bridgewater, Big V Coach Brent Russell and Huskies President Mark Bau.